Mina is tired of her husband's infidelity and decides to take a drastic decision: She takes a second husband. Based on his conversations with women involved in polygamist relationships, filmmaker Abdoulaye Dao illustrates - to very funny effects - the daily life of two persons - in this case two men - who share a spouse. On a comedic tone, Dao tells us a story of jealousy, infidelity, romance and revenge. 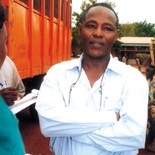 Abdoulaye Dao was born in Burkina Faso and graduated in film directing from the INAFEC (Institut Africain d’Éducation Cinématographique) in Ouagadougou, then from the INA (Institut National Audiovisuel) in Paris, and also specialized in Cairo and Dakar. He then worked for over ten years for the Télévision Nationale du Burkina Faso, before becoming head of the Direction de la Cinématographie Nationale du Burkina Faso. His series Quand les éléphants se battent received the Grand Prix for the Best TV series at FESPACO in 2007.